I will give another example of how this works. I attended a conference and met someone who was employed by the individual hosting the conference. I showed an interest. Two weeks later I was offered a job as an editor for a publishing house linked to the conference organiser. The point is, I didn’t ask for a job but by the interest I showed, and my presence in the right environment, I was remembered and offered a post that was not advertised or asked for. A tip would be to attend a conference if you can afford to, collect lots of contacts and keep in touch. 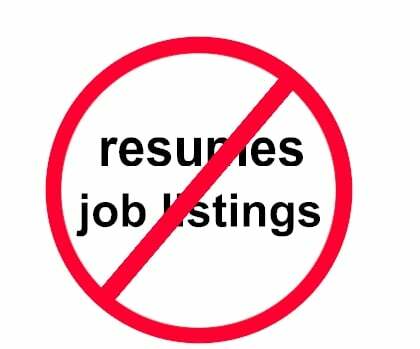 If you are suited enough to those contacts, they will favor rather than reading unsolicited resumes. Second, this process will identify jobs and even, on the first visit, produce job offers. I strongly suggest you defer. For example, if you are visiting an office and the receptionist hands you a job application, politely hand it back and say something like, “Thank you, but I’m not here to apply for a job; this is a personal visit.” If the person you’re interviewing says there is a job there that would be perfect for you and she is sooo glad you are here, and asks you to fill out an application, you would be wise to say something like, “Thank you for mentioning this, and this looks like a great place to work, but my research is not finished yet. Would it be okay if we continued our discussion, and perhaps in a week or so I could check back to see if this position is still open?” The reason for not jumping on a job immediately is two-fold: one, you really do need to talk to numerous people before applying for a job; two, and probably more important, is to maintain your credibility – if you jump at this job, in about five minutes the offeror will be wondering how you snookered him into making the job known, your credibility will be gone (you did say you wanted advice and guidance)and any chance you had of getting into that organization will be pretty much gone. If it’s a real job and they’re interested in you, it will be there in a week or two. When you say don’t look at job postings, I agree totally if those postings are on some job site. I don’t agree if the posts are on the company site. Those postings are frequently out of date, but they do offer some valuable information on what kinds of people the company is looking for which can help in research. They usually list an HR person, not the hiring manager, but your research might lead you to the actual hiring manager. They can also show you places where the company feels they have gaps. That could help in structuring the conversation. Another thing you may learn while doing your research and meeting people is which of your small list of companies are no longer worth your effort for one reason or the other. Some companies have no integrity in hiring, work through job shops and recruiters to “try before we buy”, have a good facade, but are a pit to work for, mix religion and work … or of a number of reasons you personally don’t want to become involved.